Some student athletes receive scholarships, public recognition, travel to various places around the country, a full athletic wardrobe, and more. But athletic participation may not be as glamorous as many perceive it to be. Winston-Salem State athletes have had made many changes and adjustments to their lifestyles. “It is much harder in college to be a student and an athlete. Not only do we practice every day and sometimes play three times in a week, but we also do homework, prepare for tests and make time for a social life,” said Leslie Hollis, shortstop for the Rams softball team. 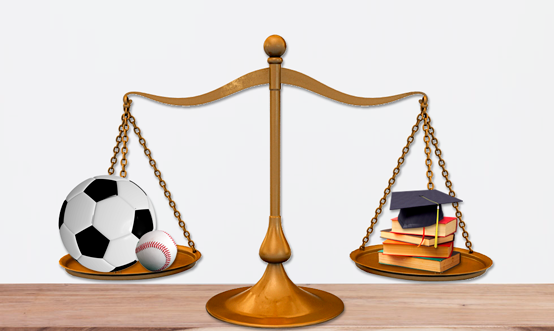 Athletes not only have academic responsibilities, but they also spend countless hours outside the classroom doing various activities in their respective sports. For example, many athletic teams return early to campus to begin preseason conditioning. The volleyball team arrives two weeks prior to the start of classes to begin preseason conditioning. The daily schedule consists of 6 a.m. conditioning, noon workouts, and 3 p.m. court practices. During the season, morning sessions are completed as needed, either at 5 or 6 a.m. Next, players go to their daily classes, and there is evening court practice from 4 to 7 p.m. Following practice is a mandatory study hall from 8 to 10 p.m. In addition, meetings, video review, and treatment of injuries take place in between these activities. Lastly, the team travels to and from various universities in athletic competition, and when scheduling permits, the team does community service work. If that is not enough, WSSU athletes have to follow all the same university rules and regulations as other students, as well as team rules and, ultimately, the National Collegiate Athletic Association (NCAA) rules. All of these rules and regulations can become stressful to student-athletes. “One has to remember what one can and cannot do, such as eating or drinking medicines or fluids that may have illegal substances; and sometimes, even normal extracurricular activities that most college students can participate in are frowned on by the NCAA,” said Andrew Jones, who plays tennis at WSSU. By following these rules and regulations, athletes make many changes in order to maintain a scholarship and team membership. NCAA rules are the governing rules for collegiate athletic participation. Some of the mandated requirements by the NCAA include a certain percentage of progress toward graduation every academic year, and athletes are limited to four years of athletic competition and aid. For example, a regular student goes out and returns to his or her dorm intoxicated at 4 a.m. and does not awaken for class the next day. This is an individual problem. However, when an athlete takes these types of actions, he or she can be suspended for a few games or suspended indefinitely. The biggest obstacle for student athletes is the race against the clock. We are on a tight schedule and constantly. Managing time between swimming and is difficult in more ways than one. Figuring out how you are going to prioritize academics school and swimming is hectic. Choosing to hang out with friends on Saturday night or to do homework is a common and disciplined choice we must make . Some Student athletes have little flexibility in between schedule. In the midst of our busy schedules, we sometimes forget we are on campus to get an education. Fitting in a job or an internship is demanding and at times can get pushed to the back burner. Our coaches say we need more sleep but finding the time to get it doesn’t come easily. Between swimming, school, and trying to be a “typical” college student, it is hard to get a full eight hours of sleep a night. Sleep deprivation takes a toll on us physically but also mentally. Remaining focused in the pool and classroom becomes even more difficult without proper rest. Getting more sleep sounds like a nice idea, yet fitting it into our schedule isn’t necessarily achievable. Continually being on-the-go means our nutrition may suffer. When rushing from lifting, swim practice, and to class while trying to fit in a snack or meal puts the focus less on nutrition and more on convenience. Time is the enemy of all, including healthy eating. A quick granola bar or protein shake are a good quick fix, but at times we need more fuel after a tough, long practice. We run our bodies down with training, but it can’t recover without the proper food and nutrition. A constant challenge student athletes face is keeping their social lives functioning. Putting twenty or more hours in and out of pools each week is exhausting. Sometimes we just want to do nothing or watch Netflix. Friday nights often consist of going to bed early due to Saturday morning practice or a meet. We should take advantage of every break we get, but our social life tends to suffer because we are often too tired or otherwise occupied. Being the student we want to be in the classroom, the swimmer we want to be in the pool, and the friend we want to be to our peers is a tough equation to solve. Building a resume can be difficult with our less than accommodating schedules. Taking part in extracurricular activities such as Accounting Club, the School Newspaper, or Animal Rights Club sounds great but swimming tends to get in the way. Meeting times are often scheduled at the same time as practice or on the weekends when meets are planned. Staring at a black line on the bottom of a pool six days a week can become monotonous and mentally exhausting. Mental health is a serious issue for many athletes. The stress of swimming, school and personal expectations can become overwhelming. Relieving stress positively is a major point in any student athlete’s life. Use a few minutes to stretch breathe, stretch, and refocus can help relieve some mental stress and exhaustion caused by being a student athlete. Feeling like the clock is consistently against you, in and out of the water, can be stressful. Having to do so much in so little time becomes taxing, and many goals seem out of reach. Managing all aspects of being a student athlete is strenuous. We all feel like the world is against us sometimes, but having an outlet to relieve stress is important as well. A major obstacle for student athletes is the race against the clock. Taking an hour to call your parents doesn’t always fit into the schedule, and we may have so much going on that we often forget. When you do finally see them, it is usually at a swim meet or the little time you spend at home over breaks. Your parents know you love them but finding the time to express your love to them isn’t always easy. The same goes for keeping in touch with your friends from home. Making friends a priority in your life becomes harder and harder as you become more involved in academics and swimming. The first thing you are taught as a student athlete is that you are held to a higher standard. Every move you make being watched by the press and the university’s pressure to perform can become burdensome. As an individual you represent your entire team and institution, and it is a great responsibility. If you consider yourself as a passionate online shopper like myself, eBay has amazing deals on the best products and exercise equipment.I hoped you enjoyed the Student Athlete-Real Student Athlete Expectations article and if you have any questions about the post want to leave a comment or want to leave your own personal review,please leave a comment below . Thanks for a realistic look into the life of a student athlete. I really admire how much time swimmers put into their sport. I could relate to some of this as a cross country and track runner, but our time commitment is definitely not as great. Good luck with your season! I never knew it could be so demanding on college athletes, I really thought it was just the opposite. Thanks for opening my eyes. I have a new found respect for the college athlete now. Great article, that also shows why athletes become so disciplined in their lives. I can imagine, it’s sometimes tough, especially when you’re young and see people your age doing more comfortable stuff. But this kind of determination will put you way ahead of your intoxicated fellow student in the future – not only in sports. Great advice not just for student athletes, but for everyone in life! Great post! Hello Erick, great blog indeed!!! WOW!! Being a college student and an athlete is a tough job. I understand that College life can be difficult, but no one said that it would be easy. It all about managing your time, planning ahead, getting the proper rest, eating right, and not working so hard. It difficult, but hard work will always pay off. I’m looking forward to reading more of your articles soon!!! Absolutely agree it is not a simple task being a student athlete and thanks for reading the article Ahmed .Also for sure hard work does pay off.